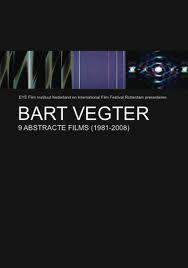 Bart Vegter (1940-2011) was self-taught and derived his primary inspiration from the methods of filmmakers such as Frans Zwartjes and Paul de Mol, and experimental cinema from the 1970s and 1980s. Before starting to shoot abstract films at age forty, Bart Vegter graduated from the Eindhoven University of Technology and worked at the laboratories of Shell and Philips. His oeuvre may be modest in size, but it excels in its eye for detail and craftsmanship. During the early years, he worked with traditional animation techniques. However, his last few films such as Nacht-Licht [Night Light], Space-Modulation and Forest-Views display a more idiosyncratic style attributable to the software he wrote. The film is a superimposition of 6 to 8 takes. In each take, a horizontal piece of white paper was moved around in front of the camera by hand. Inspired by Steve Reich’s music, a cube rotates with the same dimensions as the film frame. Compositions of planes, which originate from cross-sections of a cube, parallel to its three main axes. The first film Vegter made using image generation software that he wrote himself, consists of three parts, each with its own, formal starting-point. Gradual changes in the position, direction, movement, velocity and colour of the elements become apparent. A black plane with a large number of tiny dots gradually changes from flat to spatial to capture an image which is neither flat nor spatial. 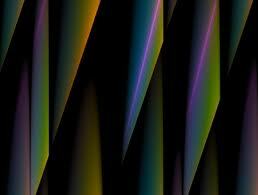 Abstract film in which the maker processed television fuzz using software thereby creating a new visual language. 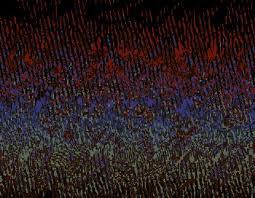 Self-written software, light-frequencies and mesmerizing abstractions. Silent images which shift between stagnation and continuous movement. A monochrome flat image changes slowly into a theatrical spectacle in which colour subtly melts and solidifies lines and conical forms.